Marvin Villadares faces a misdemeanor charge of "failure to pay full attention"
Jennifer Lawson, 39, was killed in February after being struck by a dump truck on Little Falls Road. A dump truck driver has been fined $100 and will spend six days in jail for the tragic death of an Arlington mother. Marvin Villadares, 33, of Manassass, was charged with failure to pay full time and attention in connection with the February death of Jennifer Lawson. Police said Lawson, a mother of three, was reaching into her parked minivan for one of her children when she was struck by the dump truck. She was parked outside Nottingham Elementary, her son's school, at the time. 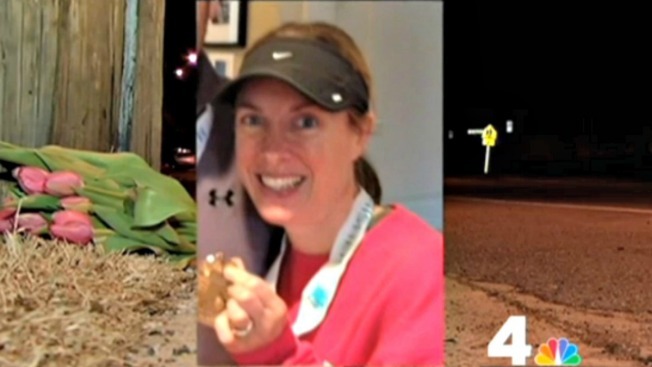 Lawson was known as a devoted mother and avid runner. Villadares pleaded not guilty in the case, though the defendant admitted the evidence was sufficient that he be found guilty. He was sentenced to 10 days in jail with four days suspended and will have to pay a $100 fine. Parents who have children at the school said they often see drivers speeding down Little Falls Road, which is narrow, with cars often parked on both sides. "I think people just go too fast. I don't have any data to back that up, but [some are] going too fast and not paying attention," parent Ingrid Saden said. Arlington Police said the decision to charge the truck driver was the result of a lengthy, detailed investigation. "We have to trust that the authorities made the right decision," said parent Cory Folliard. "There is no easy answer, no good solution to this, except to pray for all involved."